Chinese Chili Fish is a popular Indo Chinese dish, also known as Fish Chilli in some Indian restaurants. 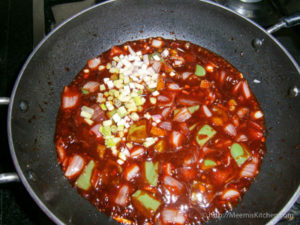 Chinese techniques and sauces are adapted and tailor made to suit Indian Palates. 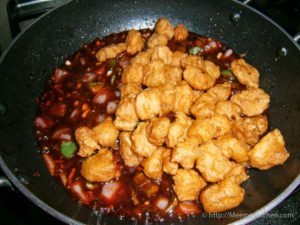 Sweet, Sour, Salty and Spicy; you can feel the perfect balance of all these flavors in this delicious Chinese dish. It never fails to impress, and once you have tried you will definitely be hooked. 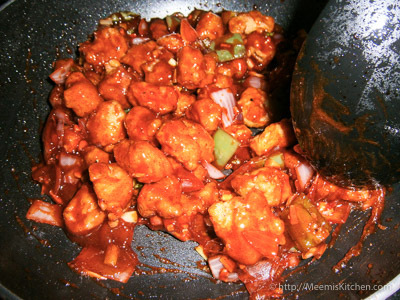 Szechuan Chilli Chicken, Chilli Gobi, Gobi Manchurian, Paneer Chilli, Chilli Pork, Soya Manchurian, Honey chilli chicken, sweet and sour Chinese dishes are quite popular in India and are often served with Chinese Noodles or Fried Rice. Chilli Fish is very delicious and satisfying and can be served dry as an appetizer or as a dry side dish. The batter fried soft fish is full of surprises; the hot and spicy chilies lend the heat, the soya sauce provide the tanginess and the bell Peppers and Onions deliver the crunch! It would spice up your cold winter evenings, a perfect dish to warm your Palates. If you are a seafood lover, check these links for other wonderful appetizers like Fish Fingers, Calamari/ Squid fritters,Fish cutlets etc. Any Fleshy white fish can be used for this, and it is prepared with very simple ingredients. I used Basa Fish fillets, it came out wonderful. When you have guests, mix the fried fish to the sauces just before serving. That way you will never lose on flavors and the freshness will remain intact. Serve it with simple fried rice or Chilli Garlic Fried rice for a great weeknight dinner. Are you ready to try this wonderful recipe? 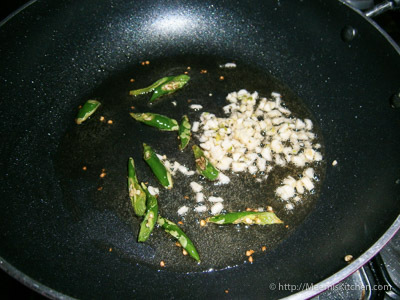 Here goes..
Green Chili : 4 -5 nos. Capsicum/ Bell Pepper : 1 no. Clean the fish fillets and cut into cubes. Marinate with little salt, Ginger Garlic paste, Pepper powder, Chili Powder and vinegar. Keep aside for 15 minutes. 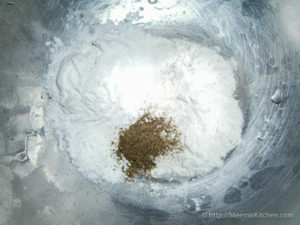 Mix the Corn flour, Maida, Pepper Powder and ½ tsp Soya sauce with little water to make a smooth batter (not very thick). Combine the marinated fish pieces in this and deep fry in oil till golden brown. Keep aside. 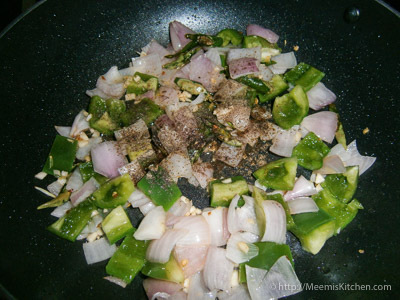 Remove excess oil and add the sliced green chilies, then finely chopped garlic. Sauté for few seconds and add the cubed Onions. 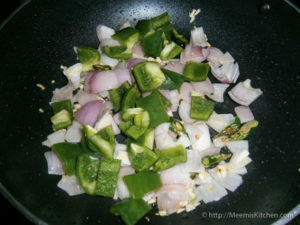 Now add the Cubed Capsicum and sauté for little time. 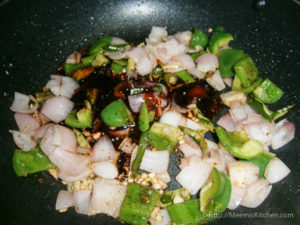 Add the pepper Powder (you may add little chili powder also, if you want it spicier) and roast for few seconds. 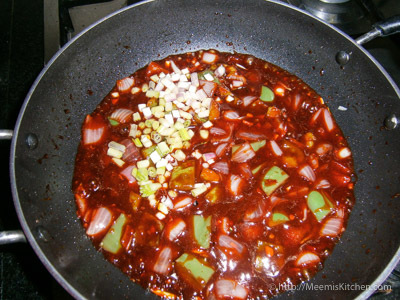 Mix the Soya sauce and Red Chili Sauce with some red food color (optional). Pour this into the pan and mix well. Add a pinch of sugar. 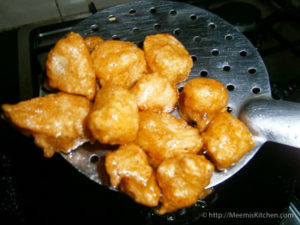 In little water add ¾ tsp Corn Flour and pour to the gravy. 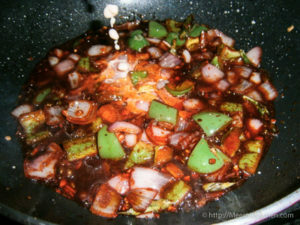 Chop the white part of the spring onion and add to the gravy. Stir to make a thick gravy and adjust the salt. Now, add the fried fish pieces and combine well. 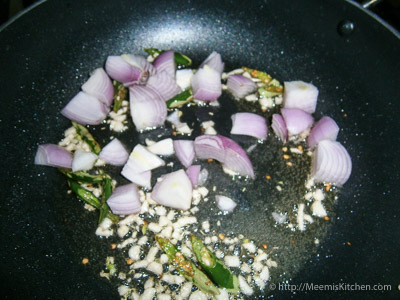 Lastly, add the chopped spring onion greens and serve hot with Fried rice, Noodles, Whole wheat Naan or Roti. 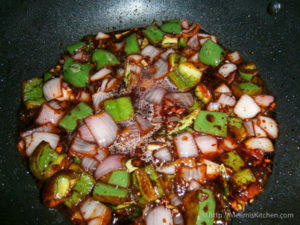 Add more green chilies if you like it spicy. 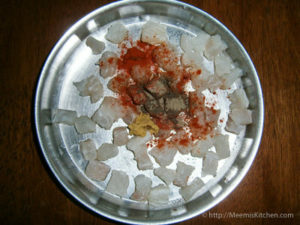 White fleshy fish is best suited for Chili Fish preparation. I used Basa Fish Fillet. King Fish Fillet or Red snapper or any white fleshy fish can be used. Fish takes less cooking time. You can deep fry or shallow fry the fish as per your liking. Fry the fish in Batches and use the same oil (remove excess oil) for making gravy. Adding sugar is to balance the flavors and seasoning. You may use Red and Yellow Bell Peppers/ Capsicum for more visual appeal. 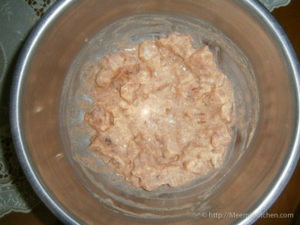 If you like with gravy, add more water/ stock and adjust the measure of sauces and add corn flour to make a thick gravy. 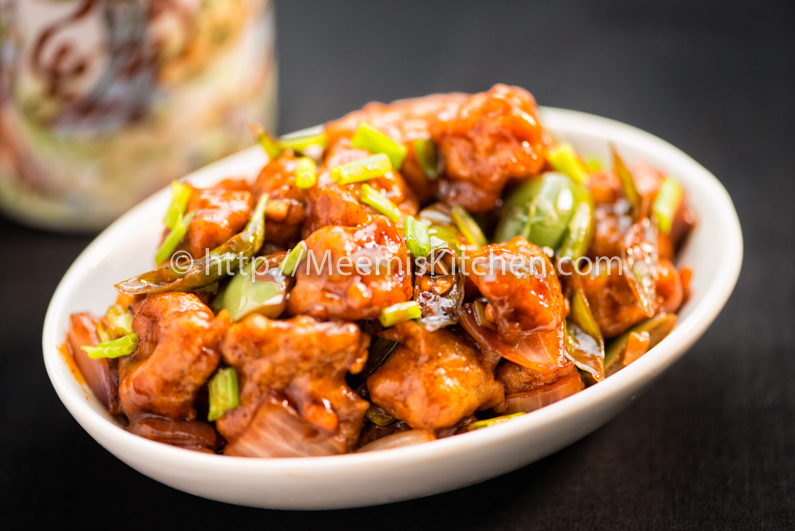 Please try this Chinese Chilli Fish recipe and let me know if you like it or share with your friends through the share buttons on the side. It will definitely inspire me to add more homemade recipes for you. Thanks and God Bless!! Thank you Princy. yea, it is very tasty. Try and enjoy. Thank you. A favourite in my house too. Thank u. Very nice. My son who is fussy about eating fish loved it too. Very happy to know that Laveena. Chilli fish is indeed very tasty. Please keep visiting!